EarlyBird has been tracking Endocyte, a biopharmaceutical company based in Indiana, USA, for some time by publishing an Endocyte Equity SmartTrack. A SmartTrack is a combination of Twitter accounts relevant to the company and smart searches. 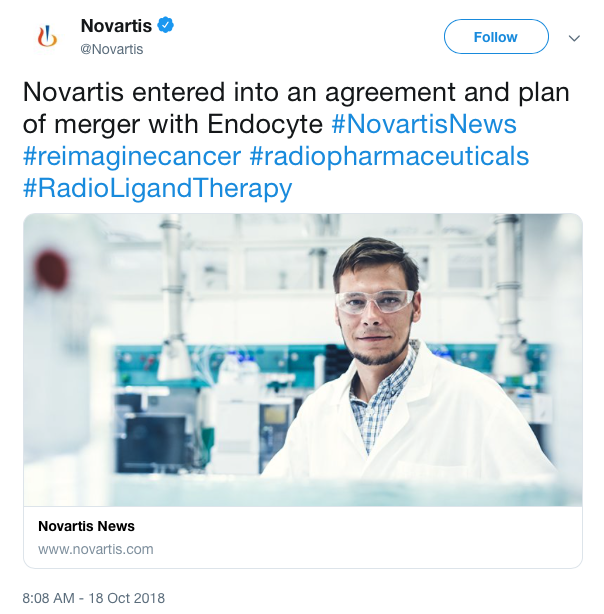 At 06:02* BST on Thursday October 18thNovartis AG issued a press release on the Globe News Wire announcing its agreed acquisition of Endocyte at $24 per share, valuing the company at $2.1bn. Endocyte issued its own release at 06:10. 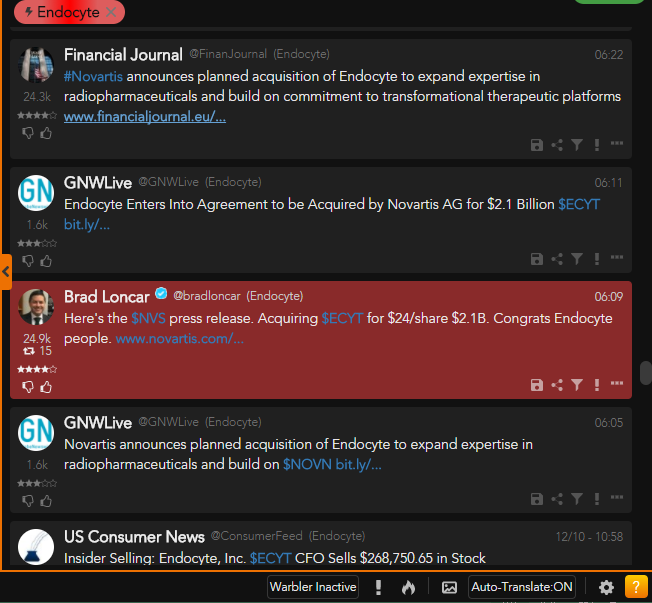 Globe News Wire (@GNWLive) Tweeted the Novartis release at 06:05 – EarlyBird’s Endocyte SmartTrack picked up this Tweet immediately. A few minutes later, at 06:09, Brad Loncar – an entrepreneur and investor – Tweeted the Novartis release. Again EarlyBird picked this up and within a few moments identified the rapidly increasing velocity of retweets from financially-focused users and highlighted the story as “going viral” - what we call a “Hot Tweet” which we highlight in red. The first major agency to Tweet the news was Bloomberg – whose Twitter feed carried the press release at 06:28 – 23 minutes after EarlyBird first picked it up, and 19 minutes after we’d identified it as hot news. Novartis itself finally Tweeted the news at 08:08, before Swiss market open. Both Endocyte and Novartis stocks were sharply higher on market open – Novartis stock on the Swiss exchange rose from CHF 83.98, the same as the previous night’s close, to CHF 85 within three minutes and closed at CHF 85.82. On NYSE Novartis opened at $85.90 having closed on Wednesday at $85.34. 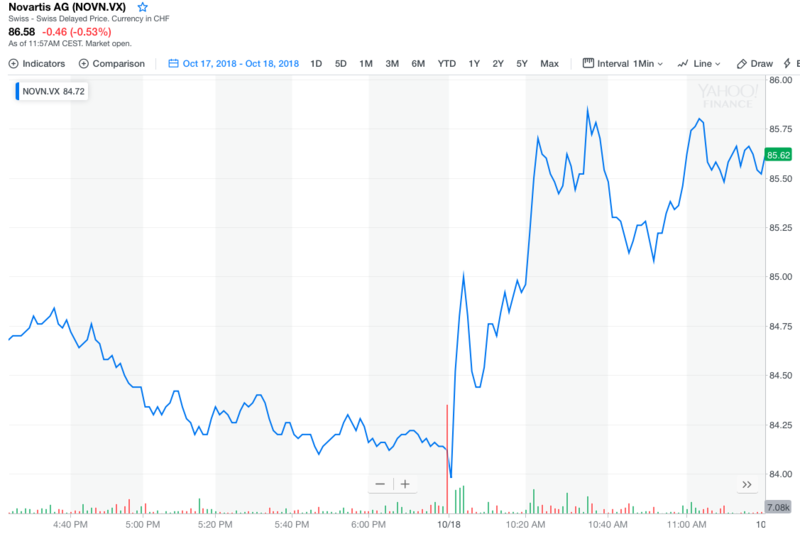 Endocyte’s stock closed Wednesday night at $15.54 and opened on Thursday at $23.36, slightly below the agreed acquisition price. It only took a handful of retweets for EarlyBird to identify this breaking story as a Hot Tweet. EarlyBird users can configure Hot Tweets to popup on their desktop and stay there until swiped away – guaranteeing that traders see the news that makes a difference, while not being overloaded with irrelevant content. EarlyBird can do this much faster than any news-agency can monitor press releases.